Fashion designer Betsey Johnson is known for her over-the-top presentations during Fashion Week, and this year was no exception. 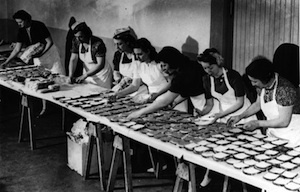 The title was "Betsey Crocker's Recipes for Dressing," and the presentation stuck to the theme: lollipop-eating models lounged around a set decorated like the primmest, most proper 1950s kitchen, complete with a black-and-white checkered floor and green milk-glass plates piled high with cookies. Soda-jerk waiters dished out hamburgers and french fries, and models attended a soda fountain / bar. Johnson herself donned a tall white chef's hat. Sadly, the closest the clothes came to being edible was the occasional cherry print. 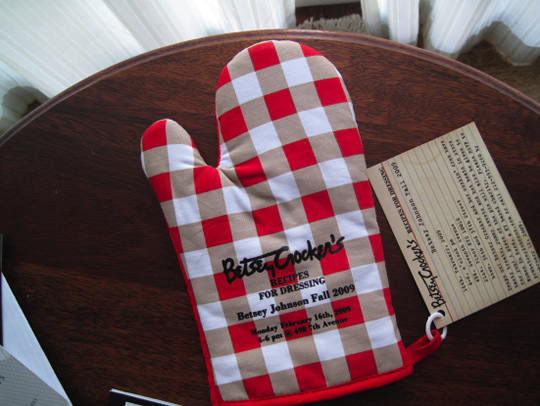 The show invite was an oh-so-apropos oven mitt, with details printed on an old-fashioned lined index card.